Slow cooker - just the job for warming winter casseroles when on shore power. 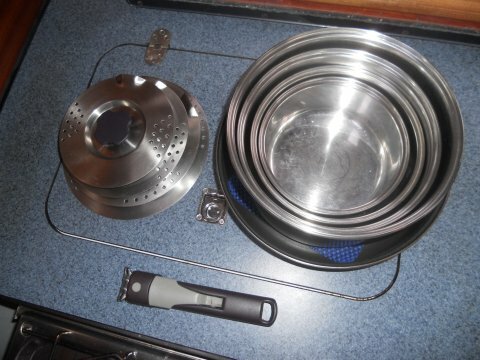 We have a set of Fagor stainless steel pans (difficult to source in the UK) which nest into each other and all but the frying pan (we bought a separate lid for it later) have lids with strainer holes as well as plastic lids for using the pans as storage bowls. The set came with two removable handles which clamp securely to the pans. The frying pan is non-stick and after 2 years of weekend use and nearly 3 years of full-time use all are in perfect condition, bar the non-stick on the frying pan which has some light scratches, even though we use wooden or plastic implements on it, but it is still very much non-stick. Boat gas cookers, in particular the ovens, are universally bad in varying degrees. Most do not have thermostatic control, making it very easy to burn what you are cooking. Cooking in one with the flame at the back means you have to keep turning your pan to avoid it burning at the back, and those with the flame at the bottom (like our Techimpex) can sometimes produce a nice crisp bottom on something like a quiche, but at other times burn it. I've seen a new GN Espace cooker at a Boat Show, which appeared to be an enormous leap in quality and design but is very expensive! 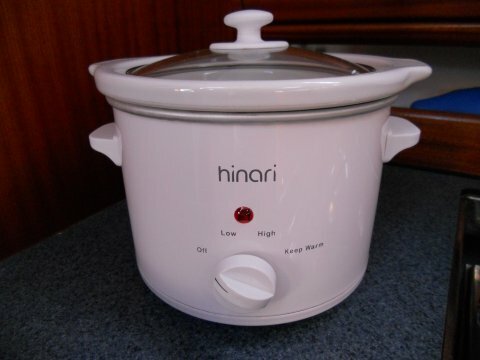 We have a slow cooker which we use frequently in the winter when we are permanently in a marina and have mains power. Ours is a small one which makes just enough for the two of us for one meal. Given more space (and I might find the space and up-size accordingly) a slightly larger slow cooker would be better as there are times when I over-cater on the preparation (well I actually maintain there is a gremlin who sneaks in extra ingredients, Andy says I just try to put in too much) and can't fit it all into our existing one! As well as using power that we have usually already paid for with the berth fee, it saves gas and also reduces some of the condensation in the winter created by burning gas. Many liveaboards have a pressure cooker for gas-saving cooking but using an electric slow cooker allows us to leave the boat for a brisk winter walk and return to a warm and fragrant boat with dinner ready, bar cooking some accompaniments or slicing up a crusty baguette and opening a bottle of wine. Our other favourite cooking wonder is our Cobb. We have, in the past, called it our Cobb barbecue, but this belies its true potential and use. It's really a whole additional grill/cooker and one that has become hugely popular with boaties, caravaners and campers. We have a separate page for Cobb tips here. Again, with space being at a premium, we don't have a full-sized mixer and/or food processor. Unless on mains electricity, we wouldn't be able to power one anyway. We have though, bought a mini processor which, although small, is perfect for processing breadcrumbs, spice pastes or marinades, pesto and the like in small quantities and includes a stick blender which is ideal for soups. This doesn't draw much current, so we can power it from the mains when we're hooked up to shore power or our 350w inverter when not. I'd also like to have an electric hand blender for baking as although most things can be done by hand with a wooden spoon and lots of elbow grease, an electric blender would give far superior results creaming butter and sugar etc. A pestle & mortar is a bit of a luxury in terms of space, but ours is quite small so earns its keep, so to speak. We've had and replaced a few non-stick aluminium baking dishes/trays, as the non-stick doesn't seem to last. I suspect that because the heat source on our cooker is at the bottom of the oven, and the oven is small, it means the heat is always quite close directly under the pan and things can burn quite easily. One of our best buys was a ceramic baking dish for just €1 in Portugal and this washes up as if it were non-stick.